Are Topoutshoes elevator shoes comfortable? Are Topoutshoes elevator shoes suitable for daily use? Will anyone know I'm wearing elevator shoes? What are the benefits of wearing Topoutshoes elevator shoes? I have a one leg shorter than the other, can you custom make shoes for leg discrepancy? Do I have to alter the length of my pants? At what time should I call the Customer Service? Why are your elevator shoes so expensive? Can you convert my regular shoes into elevator shoes? Can I exercise in height-increasing sports shoes? Are your elevator shoes heavy? Not comfortable when wear it for long. What if I don't like your elevator shoes? Do you have store here? I am worried about sizing and the exact size of the shoes. How can I make sure I order the correct size? Is the sizing different for your shoes? How does a Chinese or other international sizes convert to the USA/Canadian sizes? Should I buy my common shoe size or should I pick a smaller or larger size than usual?? The shoes I ordered are a little big. What options do I have? I wear wide width shoes. Do you have such shoes in stock? My tracking record of the package showed delivered, but I have not received my order. What do I do? I am not going to be home when my order is delivered. Do I need to sign for it? Is it safe to use credit card information to make a purchase? What are the reasons for the "declined payment" or "Failed payment"? How to determine whether the success of online payment? How to return or exchange the shoes? Do I need to fill out a Return Authorization Form? Can I return the shoes if it's not suitable for me? What is the return or exchange postage? Our Elevator Shoes are comfortable because every pair of our shoes are made with the best care and from high quality leather. The lightweight hidden increaser ensures that our shoes weigh no more than normal footwear. Our increasing layers are made from imported polyether, which exert principle of human physiology assist with scientific design of curve theory, striving to be 100% consistent with foot shape. So it is very comfortable for you to wear in your daily life.? Initially you might need to get accustomed to the higher position of your feet. And you will be soon wearing them at home, at work, at weddings just like any other regular shoes. In fact you may never compromise your height by wearing our elevator shoes again. Yes, they are! 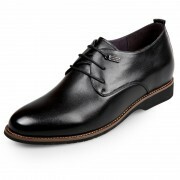 You can easily wear our shoes whole day long at home, at work, at a party, at a wedding, at a meeting, etc. While our shoes have to be a little bit taller in the back, your pant leg hangs down over the back, usually covering up the added back-height of the shoe. For the most part, our shoes look just like any other non-height-increasing shoe. Make you appear 5-13 cm taller instantly and invisibly. Help you correct posture, walk straight forward easily and keep head up. Help you gain more confidence and look charming. It comes to getting more respect, getting the promotion, and even getting the girl, the possibilities are endless. The height increase figures that show on our website are the sum of the inner sole and the outer sole. So, when we say that a model increases 6 cm for instance, it means that the inner sole and outer sole together make you as much as 6 cm taller compared to being barefoot. Generally, the answer is no. Most men wear their pants with a "break" in them on top of their shoes. 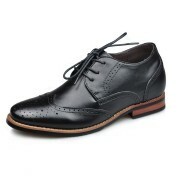 The extra length of the pants wills accommodates the extra height of the shoe so no alteration is normally necessary. Our elevator shoes are not expensive, considering the fact that they're designed and handcrafted from premium quality leather. No. 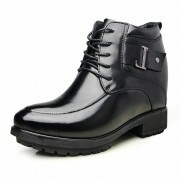 Elevator shoes imply that the height-increase is hidden. If you want to add more height to your regular shoes, you can either insert small shoe lifts or add an extra heel to the outside. Adding an extra heel on the outside is obvious and won't be as comfortable, as well-designed elevator shoes have a steady gradient of cushioning throughout the shoe. Yes. Many of our customers wear our height-increasing sporty styles at the gym for weight-training exercises. Many professional dancers wear our dress styles and thousands of grooms have danced in them. Whilst all our shoes provide plenty of cushioning and support, the most comfortable are our casual styles. We recommend trying a style that offers 5.5 – 6.5cm. No. Our elevator shoes are designed to be lightweight and durable. You need a little time to adjust these shoes. If you are first time wear the height increasing elevator shoes, you need buy the height 5.5cm to 6.5cm shoes to adjust it. The Shoes may have smell because of glue, shoe polish, and completely sealed during transportation. If that happens, Please put them in a place with good ventilation for several days. If you receive your elevator shoes and find them unsuitable, you can exchange or return them for a refund. Please read our return policy for details. Sorry, we didn't have real store at present. 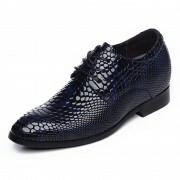 You could only purchase the shoes online. We have been online sale for 5years. We can ship to all the countries and territories. If you order subtotal is larger and want more discounts, you can click the online chat button or send the email to service@topoutshoes.com to get coupon. All the order information will be sent to your email by our system. ?If you did not find it, please check your junk email. Compare your unique measurements with our measuring guide; use our made-to-order model which allows us to send you shoes of your exact size. Since we’re an international company, our Shoes may run larger or smaller than the standard sizes you’re used to. Checking the actual measurements in our size chart and comparing them to your own measurements before placing your order is the best way to avoid size errors. Be sure to check out our measuring guide. Most of the shoes are "true to size" meaning that you should order your normal shoe size. If a certain style fits otherwise (large or small), there will be indication in the description that we advise to order a larger or smaller size. For International Shoe size conversion please see the chart below for reference. Socks matter a great deal. If you are more comfortable in thick or cushion sole socks, you might go 1/2 size larger. Try wearing thicker socks to fill out the space. You'd be surprised how much difference a pair of socks can make. If that fails, try inserting our shoe lifts into your elevator shoes. This will help fill the space and provide extra height and cushioning. If you'd prefer to exchange them for a smaller size, send us an enquiry and we'll help you. Generally our Shoes are available in Medium Width. The Medium Width should fit well on most feet. However, people with wider feet can try wearing one size bigger shoes. Yes! We can ship to all the countries and territories. And we ship them fast! Most is free shipping, if you want to ship fast; you need to pay the extra expedited shipping fee. You can calculate the shipping cost from our website by adding the items you want to order to the shopping cart. Once you done that, input your postal code and country and shipping time and cost will pop up. We usually ship it out within the 2-3 business days. Orders placed during the weekend will be shipped the following business day. In this case the package is probably lost. Please contact us to initiate a lost package inquiry immediately. When we have shipped your package out, we will send the tracking number to your order email. If you did not receive it the email, please check your junk email. We accept PAYPAL, Credit Card, T/T (Bank Transfer), Western Union. Absolutely, once you have checked out from the shopping cart the site will be automatically directed towards a secured server-Paypal. Then you can enter your credit card information which is encrypted by SSL (Secured Socket Layers). This is the most advanced online ordering security system available online. You should be able to see the word "Success!" and your order details on the screen. Yes, you can. You need to contact us via phone or chat immediately before your order placed in 48 hours.? If we have shipped your order package out, you cannot cancel it.? Yes, you can return the shoes back to us. All shoes must be returned in new un-worn condition. When we have received the returned shoes, we will refund to you. Notice: The same order for exchange back and forth second times or above, the shipping fee is at Customer cost. Perfect fit, no smell, lots of compliments!. Good quality, comfortable, and quite handsome. Takes some getting used to but they get the job done if you stick with it..